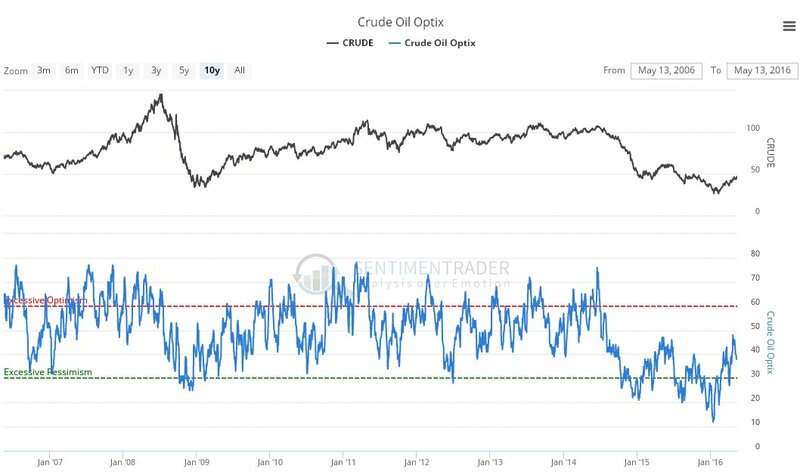 Oil did react back as predicted in the last update, dropping over $5, but then it turned around and rose to still higher levels, getting as high as about $47.50 last Thursday, as we can see on the 6-month chart for Light Crude below. However, although it has been making new 3-month highs, the advance has been losing force, with the new highs not confirmed by momentum (MACD) which has not been making new highs, and the uptrend contracting rapidly. A bearish Rising Wedge appears to be completing, and with the price well above a falling / flat 200-day moving average and in a zone of substantial resistance shown on the 3-year chart lower down the page, the chances of a reversal to the downside very soon are believed to be high. 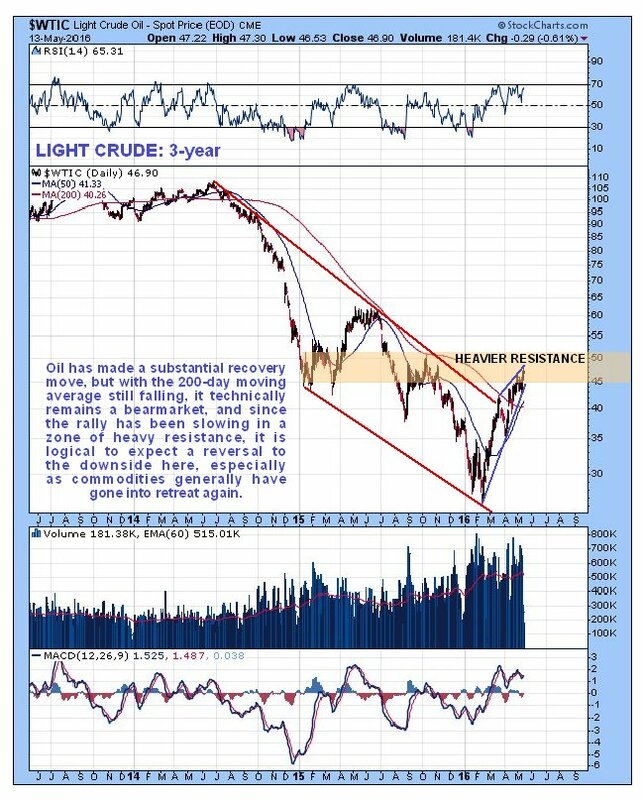 On the 3-year chart we can see that oil has advanced substantially since the bottom in mid-February, but with the advance running out of steam in the zone of quite strong resistance shown, it looks set to drop back again soon. 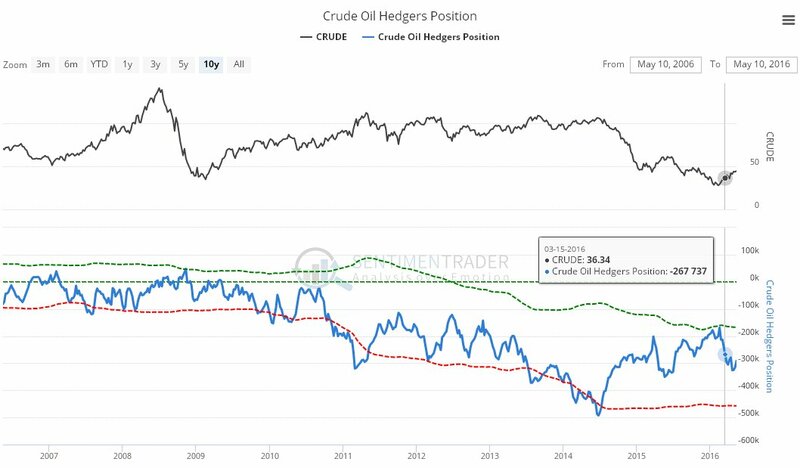 Other factors pointing to a drop soon are commodities generally dropping again, the continued decline in corporate earnings indicating recession on the horizon, and Iran pumping a lot of oil, and effectively cancelling out any reduction in output by OPEC producers. A bizarre story has been circulating that Glencore has been driving up the price of oil by buying it in vast quantities and storing it in tankers offshore, in order to corner the market and make windfall profits. If there is any truth in this story it warrants two comments - first Glencore should note what happened to the Hunt brothers when they tried to corner a commodity market back in 1980, silver, and secondly it is interesting to consider how many tankers it will take to store Iran's prodigious output, and what will happen to the price of oil when it overflows the top of these ships and is running down the sides. It sounds like utter nonsense Even if true, it can expected to backfire on them badly, and anyway, I thought Glencore was broke? 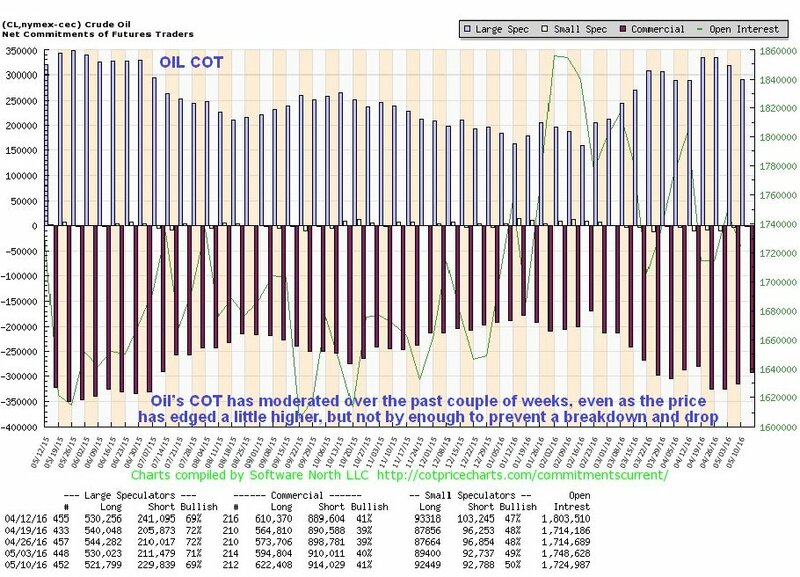 Perhaps rather oddly, the Oil COT structure has moderated somewhat over the past couple of weeks even as oil has made new highs, but certainly not by enough to prevent a breakdown and drop. 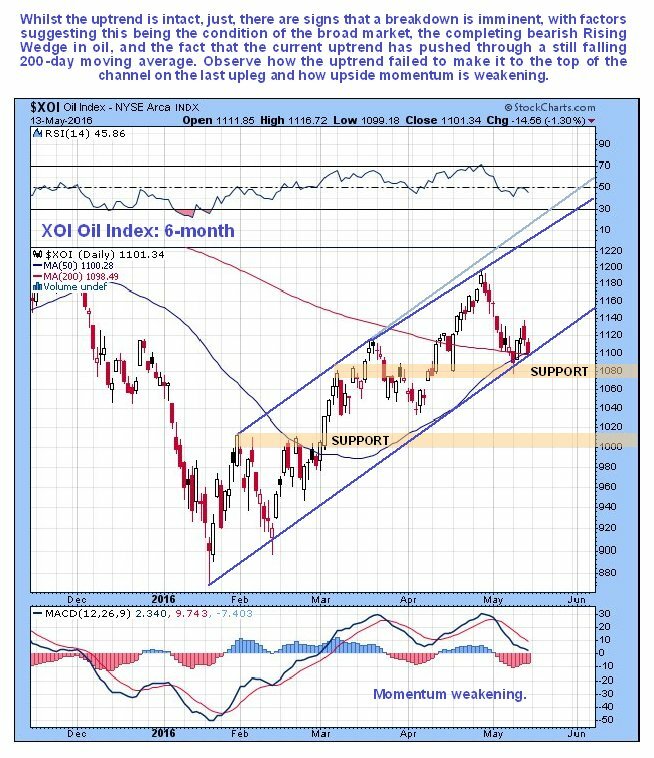 Although the uptrend in oil stocks that started in March after completion of a Rising Triangle base pattern is still intact, it is only just intact, and various factors point to a breakdown soon. 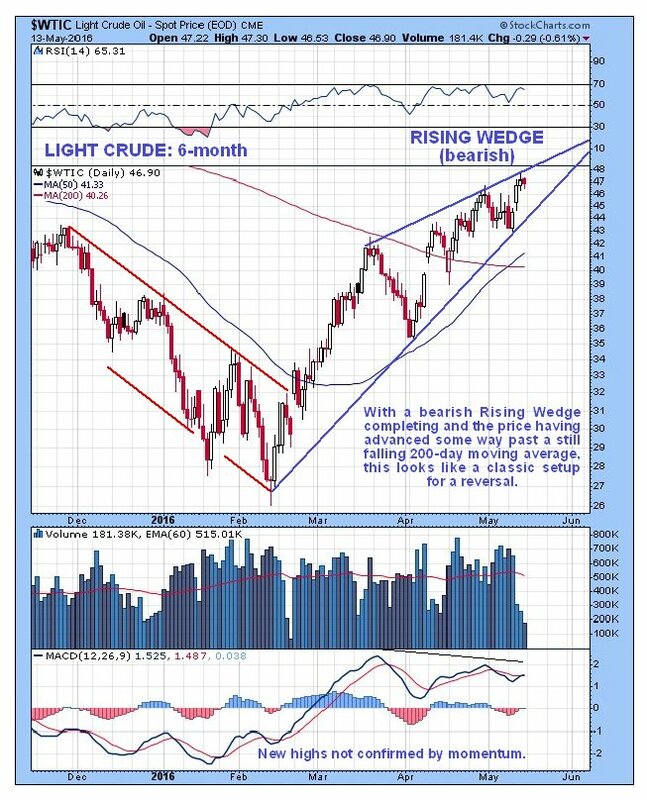 One is the condition of the broad stockmarket, which looks like it is getting ready for a substantial drop, another is the potential for further gains in the dollar, still another is the bearish Rising Wedge completing in oil itself, that we looked at above, the flat to down direction of the 200-day moving average that we can see on the 6-month chart for the XOI index shown below, and the now weak upside momentum, as shown by a lower low on the MACD indicator, all of which suggests that this index is likely to break down from the uptrend soon, despite superficially looking like it could turn up here.